OraTools is for now a plug-in for Gimp that allow to Open and save the Create project OpenRaster format, default working file format of MyPaint. To install it, download tarball, unarchive it, and read the included README.txt. Il y a aussi une version en français de cet article. I will try here to describe actual state of existing tools for advanced color palette management on GNU/Linux and via web interfaces. This is not about colorimetry but about color scheme and composition. I already put a non-exhaustive liste of color tools on this page (in french). I will try to get up-to-date time to time. Some tools was discovers with the nice french langage libre graphic news site Calcyum.org. When I write about advanced options, I think about tool able to compute complementary color or color having common paramaters, so helping to create harmonious color composition. This is not necessary for experienced eye or color expert, but can save time in color scheme. It can be nice to not respects exactly those scheme to have warmer composition. Agave (former color scheme), is an excellent GTK+ tool, but the project seem not to be really active. Kcoloredit (screenshot is another excellent tool uising Qt/KDE toolkit. It look more active. It could be very interesting to have this kind of tool in standard GTK+/Gnome or Qt/KDE toolkit libraries, allowing any graphic application to get easily benefits of a common full featured color scheme tool. 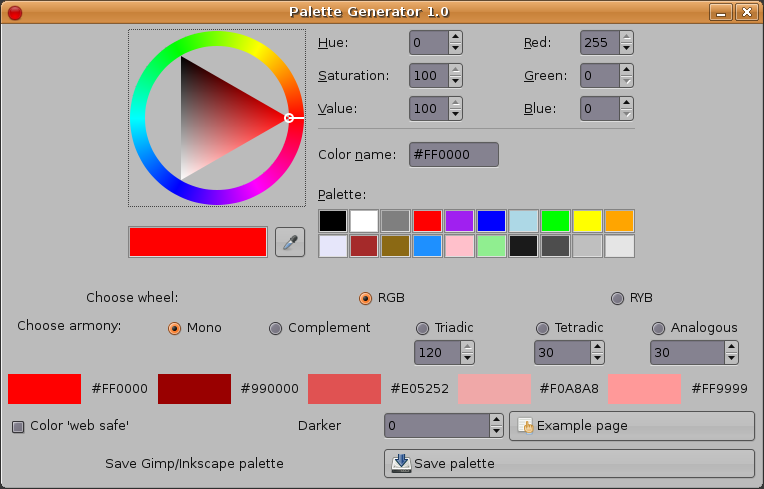 GIMP Palette generator (Gimp Registry link, screenshot) is a python plug-in giving such features into Gimp. It uses Grapefruit python color managing library. Then you can launch Gimp. You can find it in Color => Palette generator from picture window. Still for Gimp, another less usefull plugin, it could be usefull if it can allow to manipulate gimp palette from Agave. I still write about it to help for new ideas: Color Scheme Helper for Gimp (Gimp registry link) is a tool allowing to launch Agave from Gimp. launch it from Picture window => Color => Color scheme (I don’t see it in my menues don’t know why for). Swatchbooker (screenshot) is another tool, that look to have a good futur and is already very usefull. It main feature is to converet form lot of palette formats, including the GPL format (meaning Gimp Palette, not the GNU GPL license ). Ther are no advanced color scheme management for now. colormatch.dk another js tool for color scheme. Works well with last Seamonkey/Mozilla version (In maintening state). Color blend, interpole between two defined colors and display result in color, hexa, RGB (0-255 et %). Unsafe colormatch help to test unsafe colors on a web page. colr.org search color used in a picture (it is possible to give a web site). DeGraeve Color Palette Generatorgenerate a color palette with main color tons of a picture (Picture of choice can be given). An aptitud test to distinguish colors. Males are generally less good as they are potentially victim of daltonism (color blinding), femals are then more better. Wordpress color links, lot of other applications for color. J’en profite pour passer un joyeux anniversaire. Technique : Dessin sur papier au critérium (le vrai, mine 2mm), mise en couleur numérique sous Gimp, en s’inspirant des techniques de sanguines.